The word "apitherapy" comes from the Greek "apis" (bees) and "therapeía" (therapy): the etymology is self-explanatory. Apitherapy likely started with beekeeping...in about 900 B.C.! Human beings became sedentary and learned to "domesticate" bees and use their products many years ago. That explains our extensive empirical knowledge about the pearls of the beehive which include Propolis, honey, royal jelly, pollen and wax! Apitherapy was then forgotten by the general public for many years and only resurfaced for every day use quite recently. Our modern perception of this ancient practice was long associated exclusively with the use of bee venom. However, thanks to many scientific studies, the narrow definition again broadened to include all beehive products. The studies emphasized the potential of Propolis, honey, royal jelly and pollen. This wider vision also revealed the value of beehive product properties and led to their inclusion in our modern definition of apitherapy. Apitherapy is currently practised in Europe, Asia and the United States. It has already (re)conquered many countries and is gradually finding its way into family homes thanks to an increasingly extensive offering of finished products. 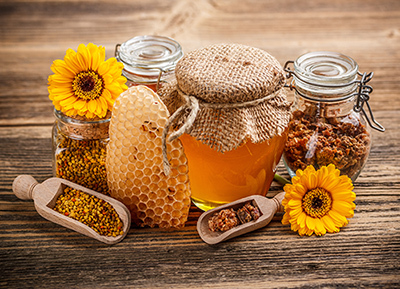 These uses and pharmaceutical forms are applications which continuously reinforce our passion for bee Propolis, royal jelly, honey, pollen and wax.